Retail Sales Associate is responsible for the sales activities of the company, to execute this job description the sales associates indulge in various duties that may include some or all of the following – greeting customers, offering assistance, answering to queries, delivering opinions, providing appropriate product information, keeping the products for display in the selling floor, assisting in organizing merchandise, processing payments, attending seminars and training classes, developing product knowledge, and closing deals with the customer profitably. 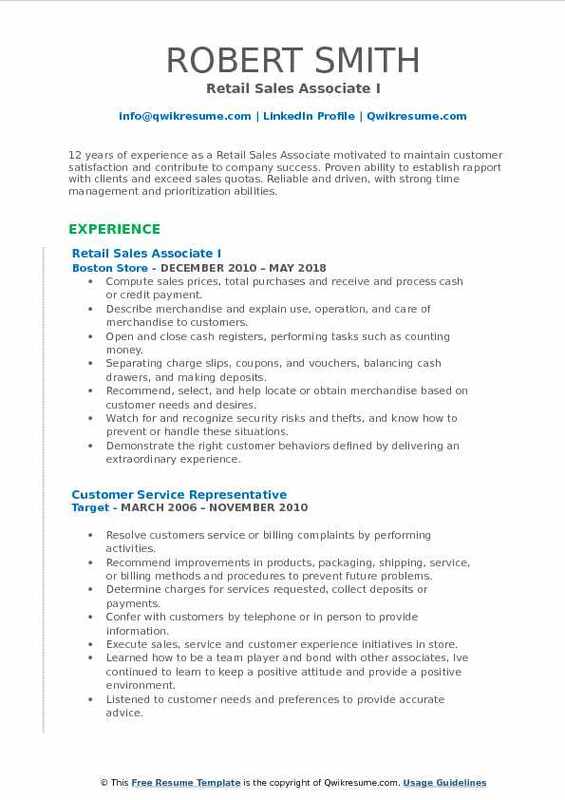 As a Retail Sales Associate, the person should have a good understanding of customer service practices, sales principles; proficiency in written and verbal communication, knowledge of market dynamics and customer requirement, telephone etiquette, being available to the needs of the customer and business; and possessing related physical demands. While a high school diploma is mandatory for this post, portraying a marketing degree in the Retail Sales Associate resume would be a plus. Objective : 2+ years of experience as a Retail Sales Associate in a fast-paced environment with experience to handle customers, customer calls, and monitor large sums of money with minimum supervision. Seeking a position in a positive and stable environment that will provide interaction with customers and allow career development opportunities within the company. Skills : Retail Management, Customer Service, Receptionist, Cash Collections, Administrative Assistant, And Merchandising. Handling equipment exchanges and upgrades, setting up new cable internet or phone service. Implementing marketing strategies which resulted in 12% growth of customer base. Developing a new process for employee evaluation which resulted in marked performance improvements. Greeting customers in a timely fashion while quickly determining their needs. Recommending merchandise to customers based on their needs and preferences. Maintaining knowledge of current sales and promotions, policies regarding payment and exchanges and security. Complete all cleaning, stocking, and organizing tasks in the assigned sales area. Built relationships with customers to increase the likelihood of repeat business. Training, coaching and monitoring staff to ensure smooth adoption of the new program. 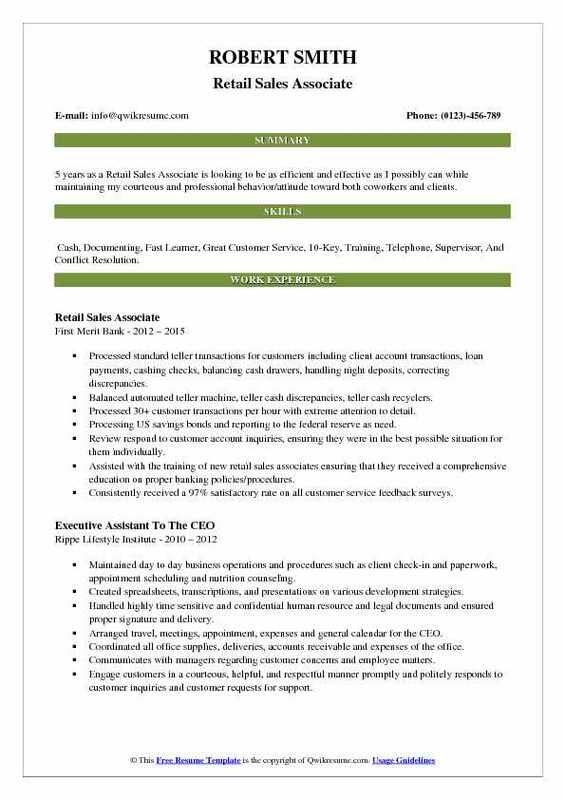 Summary : 11+ years of experience as a Retail Sales Associate is seeking employment with an Organization or Company where I can use my skills to grow and expand the place of business I am interested in working for. Recording the items being purchased by customers into the cash register manually and with a barcode reader. Validating that the items have been paid for previous to the customer leaves the store. Accepting payment from customers consisting of cash, credit, debit, cheques, and make a change. Producing a receipt that shows the amount and price of each item purchased. Greeting customers at the entrance, helping them find products, departments and answering questions. Maintaining departments dairy, including filling, facing and organizing products, and ensuring pricing and tagging. Receiving phone calls and written messages for a different department of the store. Answering various questions customers may have had regarding the store in general or item availability. By accomplishing assigned tasks correctly, efficiently, but at a faster pace, I am able to provide exceptional customer service established trust among customers, employees, management. Also able to assist other departments with various responsibilities and eventually was assigned the position of produce assistant manager. 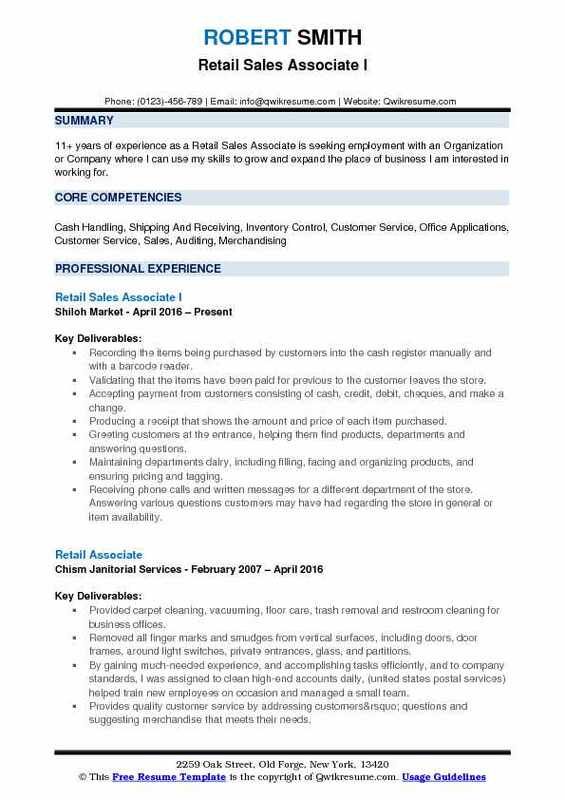 Objective : 5 years as a Retail Sales Associate is looking to be as efficient and effective as I possibly can while maintaining my courteous and professional behavior/attitude toward both coworkers and clients. Skills : Cash, Documenting, Fast Learner, Great Customer Service, 10-Key, Training, Telephone, Supervisor, And Conflict Resolution. Processed standard teller transactions for customers including client account transactions, loan payments, cashing checks, balancing cash drawers, handling night deposits, correcting discrepancies. Balanced automated teller machine, teller cash discrepancies, teller cash recyclers. Processed 30+ customer transactions per hour with extreme attention to detail. Processing US savings bonds and reporting to the federal reserve as need. Review respond to customer account inquiries, ensuring they were in the best possible situation for them individually. Assisted with the training of new retail sales associates ensuring that they received a comprehensive education on proper banking policies/procedures. Consistently received a 97% satisfactory rate on all customer service feedback surveys. 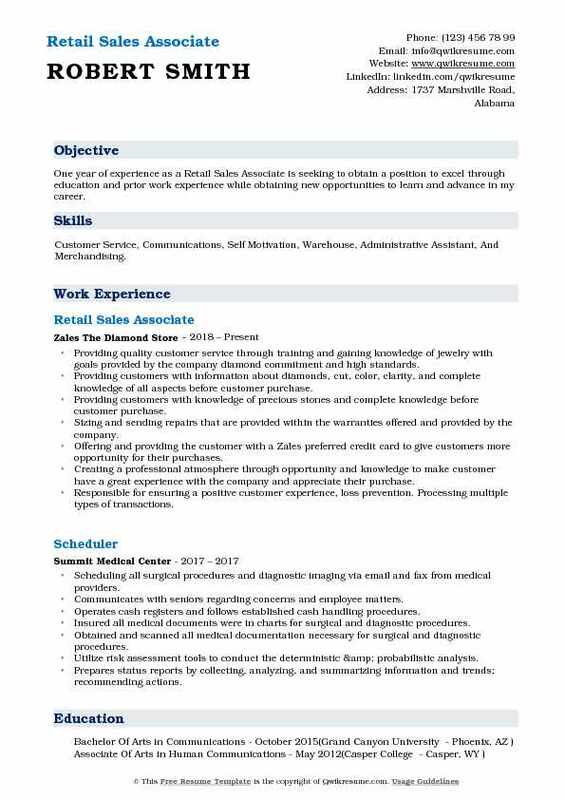 Summary : 12 years of experience as a Retail Sales Associate motivated to maintain customer satisfaction and contribute to company success. Proven ability to establish rapport with clients and exceed sales quotas. Reliable and driven, with strong time management and prioritization abilities. Skills : Microsoft Office, Multitasking, Patience, Internet Explorer, Linux, Microsoft Outlook, Microsoft Publisher, Windows XP, Windows 7, Windows 8, And Mozilla Firefox. Open and close cash registers, performing tasks such as counting money. Separating charge slips, coupons, and vouchers, balancing cash drawers, and making deposits. Demonstrate the right customer behaviors defined by delivering an extraordinary experience. 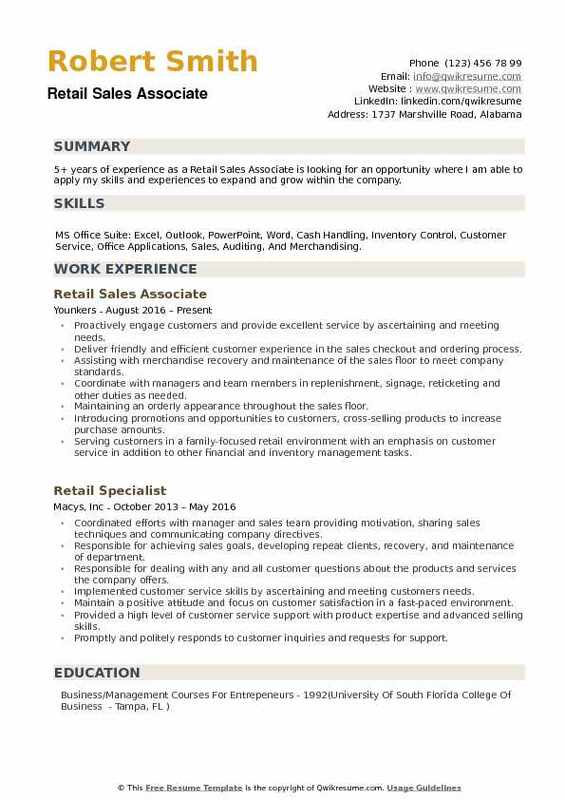 Objective : 3 years of experience as a Retail Sales Associate is seeking to obtain a position where my skills can be effectively utilized and developed in order to achieve a high level of competence. Skills : Access, BI, BI Query, LOTUS NOTES, Microsoft Office: Word, Outlook, Spreadsheet and E-mail Communication, Excellent Written and Oral Communication Skills, Independent Decision-Maker, Motivator, and the Team player. Engage in service selling and right fitting the customer with an appropriate total technology solution. Assisting customers with service activations, changes and billing payments, responding to billing inquire equipment replacement, selling accessories and processing price plan changes and upgrades. Maintain excellent store appearance and assist with store merchandising to provide a positive shopping experience for our guests. 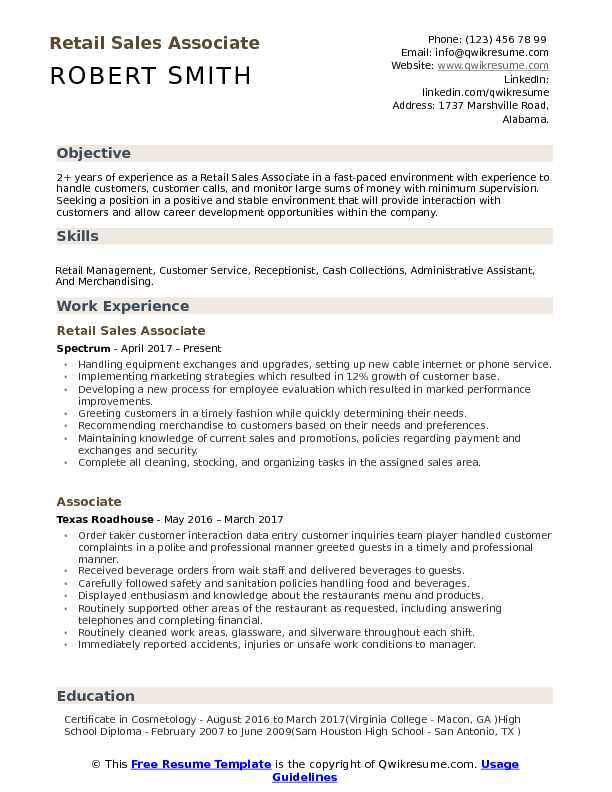 Objective : One year of experience as a Retail Sales Associate is seeking to obtain a position to excel through education and prior work experience while obtaining new opportunities to learn and advance in my career. 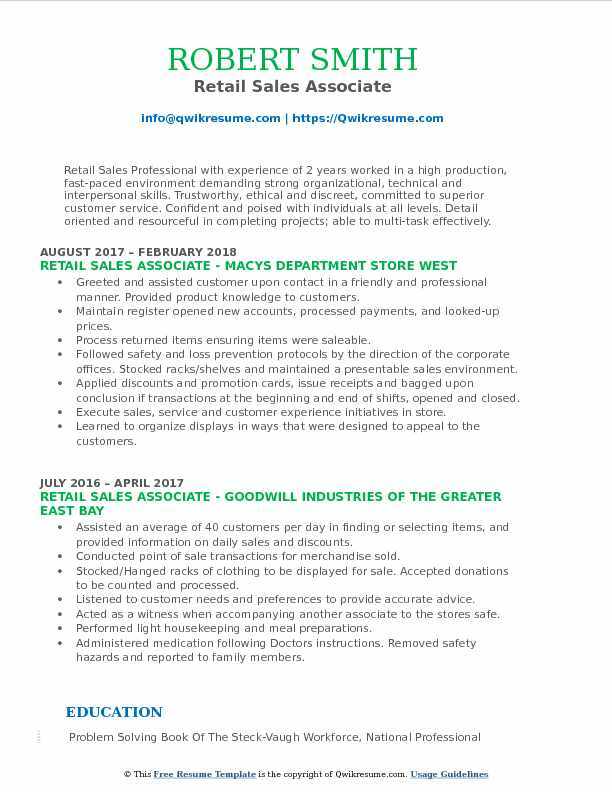 Skills : Customer Service, Communications, Self Motivation, Warehouse, Administrative Assistant, And Merchandising. Providing quality customer service through training and gaining knowledge of jewelry with goals provided by the company diamond commitment and high standards. Providing customers with information about diamonds, cut, color, clarity, and complete knowledge of all aspects before customer purchase. Providing customers with knowledge of precious stones and complete knowledge before customer purchase. Sizing and sending repairs that are provided within the warranties offered and provided by the company. Offering and providing the customer with a Zales preferred credit card to give customers more opportunity for their purchases. Creating a professional atmosphere through opportunity and knowledge to make customer have a great experience with the company and appreciate their purchase. Responsible for ensuring a positive customer experience, loss prevention. Processing multiple types of transactions. Objective : Retail Sales Professional with experience of 2 years worked in a high production, fast-paced environment demanding strong organizational, technical and interpersonal skills. Trustworthy, ethical and discreet, committed to superior customer service. Confident and poised with individuals at all levels. Detail oriented and resourceful in completing projects; able to multi-task effectively. Skills : Customer Service, Microsoft Office: Word, Excel, PowerPoint, Training Program, Retail Management, And Inventory Management. Greeted and assisted customer upon contact in a friendly and professional manner. Provided product knowledge to customers. Maintain register opened new accounts, processed payments, and looked-up prices. Process returned items ensuring items were saleable. Followed safety and loss prevention protocols by the direction of the corporate offices. Stocked racks/shelves and maintained a presentable sales environment. Applied discounts and promotion cards, issue receipts and bagged upon conclusion if transactions at the beginning and end of shifts, opened and closed. Execute sales, service and customer experience initiatives in store. Learned to organize displays in ways that were designed to appeal to the customers. 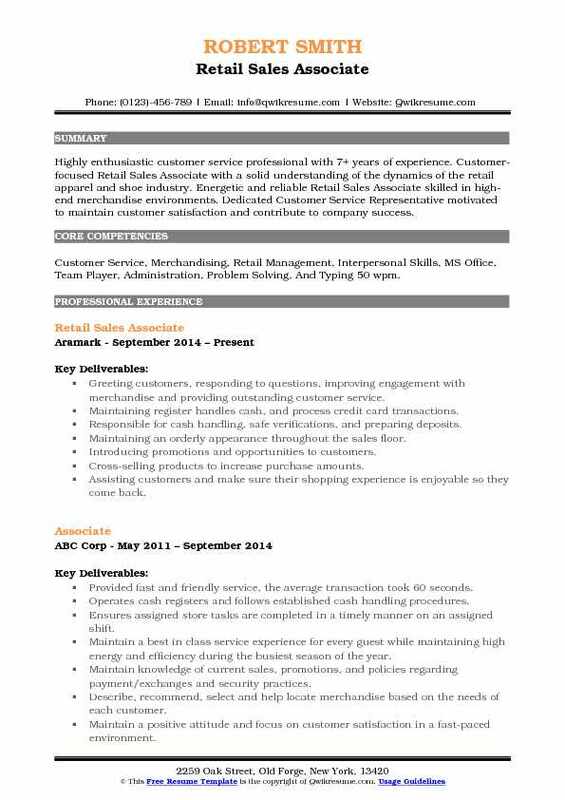 Summary : Highly enthusiastic customer service professional with 7+ years of experience. Customer-focused Retail Sales Associate with a solid understanding of the dynamics of the retail apparel and shoe industry. Energetic and reliable Retail Sales Associate skilled in high-end merchandise environments. Dedicated Customer Service Representative motivated to maintain customer satisfaction and contribute to company success. 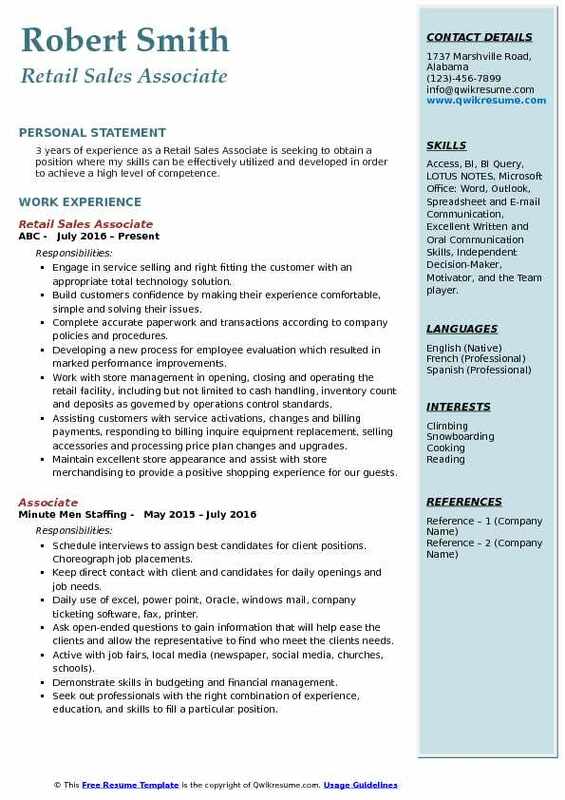 Skills : Customer Service, Merchandising, Retail Management, Interpersonal Skills, MS Office, Team Player, Administration, Problem Solving, And Typing 50 wpm. Maintaining register handles cash, and process credit card transactions. Responsible for cash handling, safe verifications, and preparing deposits. Assisting customers and make sure their shopping experience is enjoyable so they come back. Listening to customer needs and preferences to provide accurate advice. Headline : 7 years of experience as a Retail Sales To obtain a challenging position that will utilize my knowledge and experience in sales. I have held responsible positions in the past and looking forward to challenges in the future. Skills : Sales Specialist, Enthusiastic, Professional Communicator, Warehouse, Customer Service, Administrative Assistant, Merchandising, And MS Office. Approached customers and initiated conversations to determine their needs and preferences. Assisted customers with purchasing cellular phones in addition to other products including accessories, jetpacks, and tablets. Resolved customers technical questions in a timely and professional manner along with educating customers. Exceeded all sales quotas and awarded top salesperson two years in a row for tablets out of 10 stores. Provides quality customer service by addressing customers’ questions and suggesting merchandise that meets their needs. Learned how to be a team player and bond with other associates. I've continued to learn to keep a positive attitude and provide a positive environment. Stocked displays with new merchandise restocked when products were selling out. 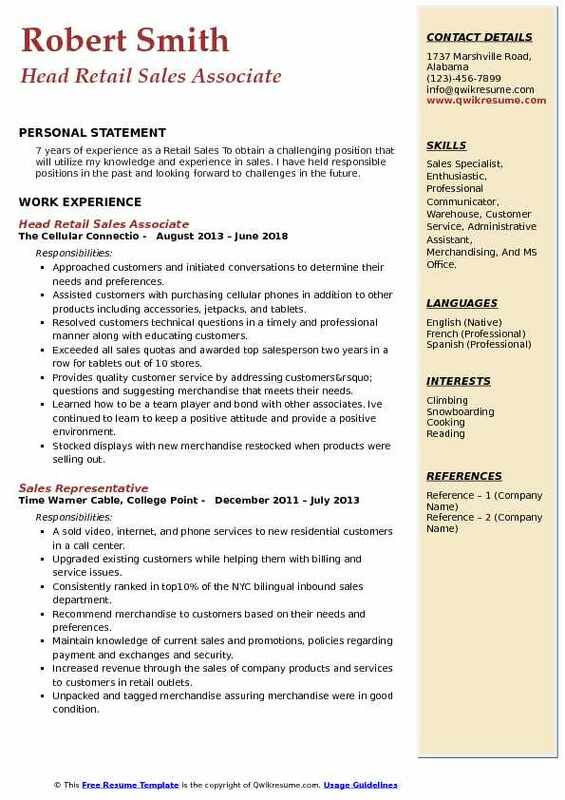 Headline : 5+ years of experience as a Retail Sales Associate is looking for an opportunity where I am able to apply my skills and experiences to expand and grow within the company. Skills : MS Office Suite: Excel, Outlook, PowerPoint, Word, Cash Handling, Inventory Control, Customer Service, Office Applications, Sales, Auditing, And Merchandising. Proactively engage customers and provide excellent service by ascertaining and meeting needs. Deliver friendly and efficient customer experience in the sales checkout and ordering process. Assisting with merchandise recovery and maintenance of the sales floor to meet company standards. Coordinate with managers and team members in replenishment, signage, reticketing and other duties as needed. Introducing promotions and opportunities to customers, cross-selling products to increase purchase amounts. Serving customers in a family-focused retail environment with an emphasis on customer service in addition to other financial and inventory management tasks. Developing new customer prospects or referrals and built customer relationships to drive sales.